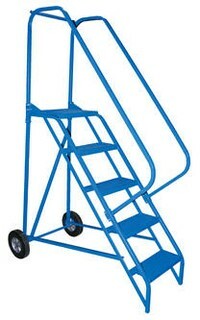 Portable ladder conveniently folds for storage. Constructed of square tubing framework which handles capacities up to 350 lbs. Features 30" high removable hand railing. While 12 step models feature a 36” removable hand railing, 14" deep top platform, and a blue baked-in powder-coated toughness, with 11 and 12 step models, an industrial blue painted finish. Each step measures 16-13/16" wide by 7" deep and is spaced 10" apart. 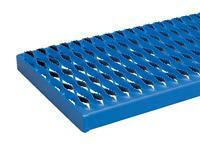 Models with 8 – 12 steps have steps that measure 23-9/16” wide. 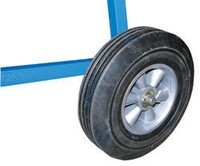 Unit rolls around on two large 10" x 2½" hard rubber wheels. Units are shipped crated, some assembly required. Complies with ANSI 14.7 and OSHA 1910.29 specifications. ZORIN will email a freight quote prior to processing the order. Any questions please give us a call (888) 378-6525. Thanks.